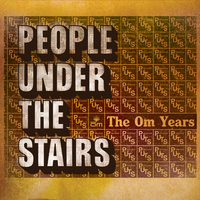 Om is proud to present People Under the Stairs “The Om Years,” a two disc collection featuring fan favorites and a disc of B-sides and rarities never before released on CD. The first ever Om retrospective of dusty breaks and funky rhyme classics from People Under the Stairs, or The P (as their fans know them). Called “The dopest of dope” by hip-hop fans the world over and featured in every magazine, website, blog, radio station you know, The P stand as one of the greatest hip-hop groups ever. If you’re a new jack, now’s the time to check The P out for the first time, or go back and re-discover why you loved them so much in the first place.